For other uses, see Saint-Sulpice (disambiguation). 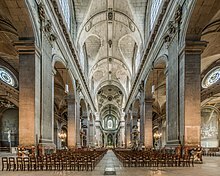 Saint-Sulpice (French pronunciation: ​[sɛ̃sylpis]) is a Roman Catholic church in Paris, France, on the east side of Place Saint-Sulpice, in the Odéon Quarter of the 6th arrondissement. It is only slightly smaller than Notre-Dame and thus the second largest church in the city. It is dedicated to Sulpitius the Pious. Construction of the present building, the second church on the site, began in 1646. 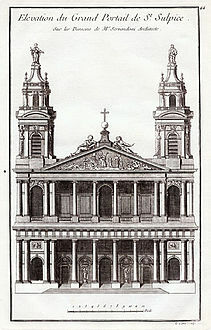 During the 18th century, an elaborate gnomon, the Gnomon of Saint-Sulpice, was constructed in the church. The present church is the second building on the site, erected over a Romanesque church originally constructed during the 13th century. Additions were made over the centuries, up to 1631. The new building was founded in 1646 by parish priest Jean-Jacques Olier (1608–1657) who had established the Society of Saint-Sulpice, a clerical congregation, and a seminary attached to the church. Anne of Austria laid the first stone. Construction began in 1646 to designs which had been created in 1636 by Christophe Gamard, but the Fronde interfered, and only the Lady Chapel had been built by 1660, when Daniel Gittard provided a new general design for most of the church. 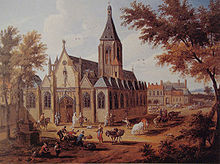 Gittard completed the sanctuary, ambulatory, apsidal chapels, transept, and north portal (1670–1678), after which construction was halted for lack of funds. Gilles-Marie Oppenord and Giovanni Servandoni, adhering closely to Gittard's designs, supervised further construction (mainly the nave and side-chapels, 1719–1745). The decoration was executed by the brothers Sébastien-Antoine Slodtz (1695–1742) and Paul-Ambroise Slodtz (1702–1758). In 1723–1724 Oppenord created the north and south portals of the transept with an unusual interior design for the ends: concave walls with nearly engaged Corinthian columns instead of the pilasters found in other parts of the church. He also built a bell-tower on top of the transept crossing (c. 1725), which threatened to collapse the structure because of its weight and had to be removed. This miscalculation may account for the fact that Oppenord was then relieved of his duties as an architect and restricted to designing decoration. 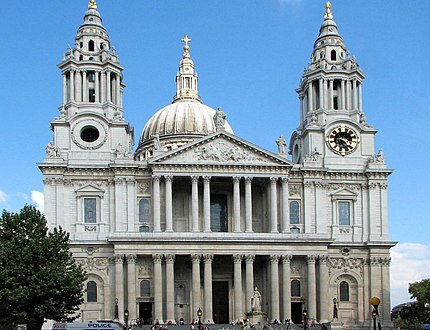 In 1732 a competition was held for the design of the west facade, won by Servandoni, who was inspired by the entrance elevation of Christopher Wren's Saint Paul's Cathedral in London. 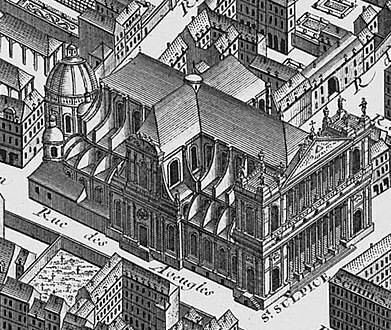 The 1739 Turgot map of Paris shows the church without Oppenord's crossing bell-tower, but with Servandoni's pedimented facade mostly complete, still lacking however its two towers. Unfinished at the time of his death in 1766, the work was continued by others, primarily the obscure Oudot de Maclaurin, who erected twin towers to Servandoni's design. Servandoni's pupil Jean Chalgrin rebuilt the north tower (1777–1780), making it taller and modifying Servandoni's baroque design to one that was more neoclassical, but the French Revolution intervened, and the south tower was never replaced. Chalgrin also designed the decoration of the chapels under the towers. The principal facade now exists in somewhat altered form. Servandoni's pediment, criticized as classically incorrect because its width was based on the entire front rather than the size of the order on which it rested, was removed after it was struck by lightning in 1770 and replaced with a balustrade. This change and the absence of the belvederes on the towers bring the design closer in spirit to that of the severely classical east front of the Louvre. The facade is an unorthodox essay in which a double colonnade, Ionic order over Roman Doric with loggias behind them, unifies the bases of the corner towers with the façade; this fully classicising statement was made at the height of the rococo. Its revolutionary character was recognised by the architect and teacher Jacques-François Blondel, who illustrated the elevation of the façade in his Architecture françoise of 1752, remarking: "The entire merit of this building lies in the architecture itself... and its greatness of scale, which opens a practically new road for our French architects." Large arched windows fill the vast interior with natural light. The result is a simple two-storey west front with three tiers of elegant columns. The overall harmony of the building is, some say, only marred by the two mismatched towers. 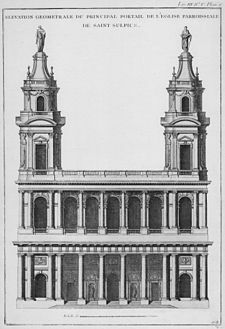 Another point of interest dating from the time of the Revolution, when Christianity was suppressed and Saint-Sulpice became a place for worship of the "Supreme Being", is a printed sign over the center door of the main entrance. One can still barely make out the printed words ‘’Le Peuple Francais Reconnoit L’Etre Suprême Et L’Immortalité de L’Âme’’ ("The French people recognize the Supreme Being and the immortality of the soul"). Inside the church to either side of the entrance are the two halves of an enormous shell (Tridacna gigas) given to King Francis I by the Venetian Republic. They function as holy water fonts and rest on rock-like bases sculpted by Jean-Baptiste Pigalle. Pigalle also designed the large white marble statue of Mary in the Lady Chapel at the far end of the church. The stucco decoration surrounding it is by Louis-Philippe Mouchy. Pigalle's work replaced a solid-silver statue by Edmé Bouchardon, which vanished at the time of the Revolution. It was cast from silverware donated by parishioners and was known as "Our Lady of the Old Tableware". The baroque interior of the Lady Chapel (rebuilt by Servandoni in 1729) was designed by Charles de Wailly in 1774, after the chapel was badly damaged by a fire which destroyed the nearby Foire Saint-Germain in 1762. The dome, lit by natural light from hidden windows devised by de Wailly, contains a fresco by François Lemoyne depicting the Assumption of Mary, which dates from 1734, although it has been restored several times since then. 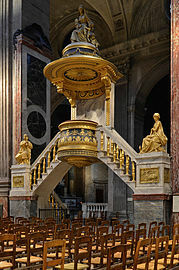 De Wailly also designed the pulpit (in the nave), completed in 1788. The oak canopy broadcasts sound very well and it was from here that the parish priest of Saint-Sulpice declared his refusal to accept the Civil Constitution of the Clergy. Revolutionary orators used it later also. 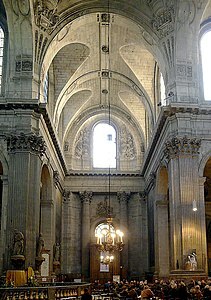 During the Directory, Saint-Sulpice was used as a Temple of Victory. Redecorations to the interior, to repair extensive damage still remaining from the Revolution, were begun after the Concordat of 1801. 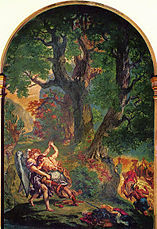 Eugène Delacroix added murals (1855–1861) that adorn the walls of the Chapel of the Holy Angels (first side-chapel on the right). 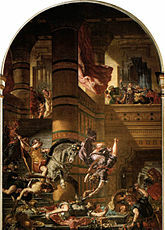 The most famous of these are Jacob Wrestling with the Angel and Heliodorus Driven from the Temple. The Marquis de Sade and Charles Baudelaire were baptized in Saint-Sulpice (1740 and 1821, respectively), and the church also saw the marriage of Victor Hugo to Adèle Foucher (1822). During the Paris Commune (1871) one faction, called the Club de la Victoire, chose Saint-Sulpice as its headquarters and Louise Michel spoke from the pulpit. Louise Élisabeth de Bourbon and Louise Élisabeth d'Orléans, grand daughters of Louis XIV and Madame de Montespan are buried in the church. Louise de Lorraine, duchesse de Bouillon and wife of Charles Godefroy de La Tour d'Auvergne, was buried here in 1788. On 17 March 2019, either a single criminal or a group of criminals set the church on fire. Police later confirmed the fire was an arson attack. The fire climbed up the doors before spreading to the stained glass above them and to a nearby stairway causing great damage, the stairway being described as having disappeared. While 18th-century building parts are irreplacable from a historical viewpoint, reparation costs will be forced upon the City of Paris, i.e. , its taxpayers. Worse still, there was an organ concert for which a crowd had gathered in the church, when the fire was lit. Fortunately, there were no immediate casualties or severe physical damages to the people involved in the incident. The crowd alerted fire fighters, who succeeded in quelling the fire, but initial reporting failed to address the economic, cultural and psychological damages, summarizing it as "nobody hurt". The church has a long-standing tradition of talented organists that dates back to the eighteenth century (see below). In 1862, Aristide Cavaillé-Coll rebuilt the existing organ built by François-Henri Clicquot. The case was designed by Jean-François-Thérèse Chalgrin and built by Monsieur Joudot. Though using many materials from Clicquot's French Classical organ, it is considered to be Cavaillé-Coll's magnum opus, featuring 102 speaking stops on five manuals and pedal, and is perhaps the most impressive instrument of the romantic French symphonic-organ era. Its organists have been renowned, starting with Nicolas Séjan in the 18th century, and continuing with Charles-Marie Widor (organist 1870-1933), Marcel Dupré (organist 1934-1971), and Jean-Jacques Grunenwald (organist 1973-1982), organists and composers of high international reputation. 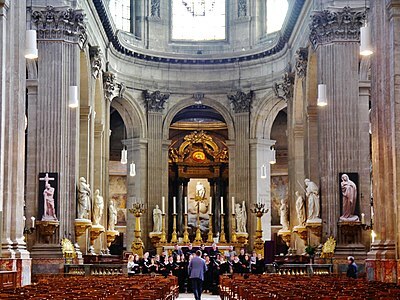 For over a century (1870–1971), Saint-Sulpice employed only two organists, and much credit is due to these musicians for preserving the instrument in its original state. The current organists are Daniel Roth (titular organist, since 1985) and Sophie-Véronique Cauchefer-Choplin (organiste titulaire-adjointe, since 1985). Aside from a re-arrangement of the manuals in 1903, the installation of an electric blower in the 1920s, and the addition of two Pedal stops upon Widor's retirement in 1933 (Principal 16' and Principal 8', donated by the Société Cavaille-Coll), the organ is maintained today almost exactly as Cavaillé-Coll originally completed it in 1862. The dates indicate when the organist was titulaire. In 1727, Jean-Baptiste Languet de Gergy, then priest of Saint-Sulpice, requested the construction of a gnomon in the church as part of its new construction, to help him determine the time of the equinoxes and hence of Easter. A meridian line of brass was inlaid across the floor and ascending a white marble obelisk, nearly eleven metres high, at the top of which is a sphere surmounted by a cross. The obelisk is dated 1743. In the south transept window a small opening with a lens was set up, so that a ray of sunlight shines onto the brass line. At noon on the winter solstice (21 December), the ray of light touches the brass line on the obelisk. At noon on the equinoxes (21 March and 21 September), the ray touches an oval plate of copper in the floor near the altar. Constructed by the English clock-maker and astronomer Henry Sully, the gnomon was also used for various scientific measurements. This rational use may have protected Saint-Sulpice from being destroyed during the French Revolution. Act III, scene ii of Massenet's opera Manon takes place in Saint-Sulpice, where Manon convinces des Grieux to run away with her once more. Abbé Herrera from Splendeurs et misères des courtisanes by Honoré de Balzac celebrated Mass in the church and lived nearby in the rue Cassette. The fashionable public side of Saint-Sulpice inspired Joris-Karl Huysmans perversely to set action there in his 1891 novel Là-Bas, dealing with Satanism in which the ritual magician "Eliphas Levi" attended the seminary attached to the church. References to the church of Saint-Sulpice are found in the so-called Dossiers Secrets that were planted in the Bibliothèque Nationale in the 1960s. In Lynn Picknett and Clive Prince's The Templar Revelation (1997), Saint-Sulpice is noted. (...) Contrary to fanciful allegations in a recent best-selling novel, this [the line in the floor] is not a vestige of a pagan temple. No such temple ever existed in this place. It was never called a «Rose-Line». It does not coincide with the meridian traced through the middle of the Paris Observatory which serves as a reference for maps where longitudes are measured in degrees East or West of Paris. (...) Please also note that the letters «P» and «S» in the small round windows at both ends of the transept refer to Peter and Sulpice, the patron saints of the church, and not an imaginary «Priory of Sion». In 2005, the Archdiocese of Paris refused Ron Howard permission to film inside Saint-Sulpice when he was making The Da Vinci Code. ^ "Daniel Roth" (in French). Association pour le rayonnement des orgues Aristide Cavaillé-Coll de l’église Saint-Sulpice (Paris). Retrieved July 4, 2018. ^ In 1655 Louis Le Vau submitted a design, essentially an augmentation of Gamard's project, but Gittard's proposal, in its turn largely based on the plans of Gamard and Le Vau, was preferred (Himmelfarb 1998; Ayers 2004, p. 126). ^ a b Himmelfarb 1998; Ayers 2004, pp. 126–127. ^ a b c Terrien 2004, p. 17. ^ a b Ayers 2004, pp. 126–127. ^ The south tower is 5 meters shorter, and the stonework is unfinished (Terrien 2004, p. 21). See also Ayers 2004, pp. 126–127. ^ Terrien 2004, pp. 21, 31. ^ Jacques-François Blondel, Architecture françoise (1752). ^ A contrast in styles is presented by Juste-Aurèle Meissonier's fully rococo project for the Saint-Sulpice façade made some six years earlier, a "rococo reminiscence of North Italian baroque" illustrated by W. Knight Sturges, "Jacques-François Blondel" The Journal of the Society of Architectural Historians 11.1 (March 1952:16-19) p17 fig. 2b. ^ Blondel's plate shows the facade as planned at the time, with as yet unexecuted features, such as the balustrade in place of the pediment and towers in Servandoni's design (see here). He mentions in his text, but declined to illustrate, a projected (unexecuted) third Corinthian order on the rear wall separating the church from the porch. ^ Blondel 1752, Architecture françoise, tome 2, livre 3, p. 40: "Ce monument qui tient tout son mérite de l'Architecture, & dont la grandeur annonce à nos Architectes François une route presque nouvelle...." Quoted in Sturges 1952:17. ^ a b Terrien 2004, p. 33. ^ Terrien 2004, p. 27. ^ Terrien 2004, p. 22. ^ Terrien 2004, pp. 21–22. ^ Terrien 2004, p. 28. ^ a b Kauffmann 2003, p. 37. ^ Terrien 2004, p. 35, who refers to the agreement with the variant name "Concordat of 1802". ^ Terrien 2004, p. 38; Jack J. Spector, The Murals of Eugène Delacroix at Saint-Sulpice (New York: College Art Association) 1967. ^ Gairaud, Marie-Anne (March 18, 2019). "Paris: l'incendie à l'église Saint-Sulpice n'était pas accidentel" [Paris: The Fire at Saint-Sulpice Church Was Not Accidental]. Le Parisien (in French). The origin of the incident is, according to the first conclusions of the central laboratory of the police headquarters, ‘human’ and ‘deliberate’. 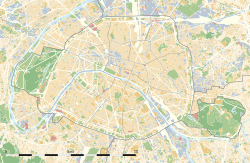 ^ "Paris' historic Saint-Sulpice church briefly catches fire, nobody hurt". Reuters. March 17, 2019. Retrieved March 19, 2019. A fire brigade spokesman said [that] the cause of the fire was not immediately known. ^ Organists of the great organ. www.aross.fr. Retrieved May 4, 2018. ^ The great organ. www.aross.fr. Retrieved May 4, 2018. ^ Sunday Mass and audition & Concerts. www.aross.fr. Retrieved May 4, 2018. ^ Great organ specification. www.aross.fr. Retrieved May 4, 2018. ^ The information in this list is from "Organists of the great organ" at www.aross.fr. Retrieved May 4, 2018. ^ The choir organ. www.aross.fr. Retrieved May 4, 2018. 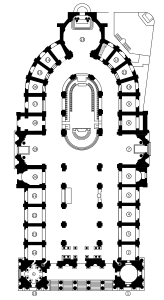 ^ Choir organ specification. www.aross.fr. Retrieved May 4, 2018. ^ Easter Sunday is to be celebrated on the first Sunday following the full moon after the spring equinox. Himmelfarb, Hélène (1996). "Gittard, Daniel", vol. 12, p. 747, in The Dictionary of Art (34 volumes), edited by Jane Turner. New York: Grove. ISBN 9781884446009. See also at Oxford Art Online (subscription required). Kauffmann, Jean-Paul (2003). Wrestling with the Angel: The Mystery of Delacroix's Mural. London: Harvill. ISBN 9781843430179. Terrien, Laurence, translator (2004). Saint-Sulpice. Paris: Paroisse Saint-Sulpice. OCLC 915105541. Wikimedia Commons has media related to Église Saint-Sulpice. This page was last edited on 21 April 2019, at 23:22 (UTC).